الخيار الأفضل للحصول على المتعة والاسترخاء, Airport Ascot Motel يقع في منطقة Hamilton في بريسبان. لا يبعد الفندق كثيراً عن مركز المدينة، فهو يقع على بعد 6. Km منها. في حين يستغرق الطريق منها إلى المطار حوالي 15 دقيقة. إن سهولة الوصول من الفندق إلى المعالم السياحية الشهيرة الكثيرة في المدينة كمثل أسواق بوتيك في رصيف بورتسايد, رصيف بورتسايد, Brisbane Cruise Terminal & Portside هو استثنائي بحد ذاته. إن الخدمات التي يقدمها Airport Ascot Motel تضمن للنزلاء إقامة مريحة. تتضمن الميزات الرئيسية في هذا الفندق: واي فاي مجاني في جميع الغرف, مرافق مخصصة لذوي الاحتياجات الخاصة, تسجيل وصول/خروج سريع, تخزين الأمتعة, واي فاي في المناطق العامة. بالإضافة لهذا,تتضمن كل غرف الضيوف مجموعة واسعة من وسائل الراحة . بعض الغرف توفر حتى تلفزيون بشاشة مسطحة, اتصال لاسلكي بالإنترنت, غرف لغير المدخنين, مكيف هواء, تدفئة لإرضاء أكثر الضيوف تطلباً. يمكنك الاستمتاع بالأجواء المريحة التي تقدمها مسار جولف - ضمن 3 كم طوال النهار. إن Airport Ascot Motel هو خيار ذكي بالنسبة للمسافرين إلى بريسبان، بما يوفره من إقامة هادئة ومرحة. يرجى العلم أنه يجب على النزلاء إبلاغ الفندق بتفاصيل رحلة الطيران أو الوقت التقريبي للوصول، وذلك أثناء إجراء الحجز. يُرجى ملاحظة أن مكتب الاستقبال مفتوح من الساعة 7 صباحًا إلى 9 مساءً يوميًا. إذا كنت ستصل خارج هذه المواعيد فيرجى الاتصال بالاستقبال مباشرة قبل 24 ساعة على الأقل من الوصول لمعرفة تعليمات كيفية استلام المفتاح. يُرجى العلم بأنه لا توجد خدمات مواصلات بالحافلة من مطار بريسبان إلى الموتيلات. يوفر الموتيل خدمة النقل اليومي بالحافلة إلى مطار بريسبان من الساعة 4:20 صباحًا إلى 9:20 صباحًا (مقابل رسوم). يُرجى إعلام الموتيل مسبقًا بما إذا كنت تريد استخدام هذه الخدمة. We often stay here overnight if we are catching an early plane. The location offers a choice between the Racecourse Rd. eateries or the Wharf area. We love everything on offer around these areas to get our holiday off to a great start before even taking off. The staff are very friendly and the rooms are basic but spotlessly clean. Excellent value for money. We stayed overnight before catching an early flight. The location so close to the wharf development is excellent. We went to a movie, had a delicious lunch and dinner from a wide choice of restaurants and enjoyed a few drinks at one of the bars. We watched a ship leave the port which kick started our holiday mood. The hotel was very comfortable and the staff were happy to go out of their way to make our stay enjoyable. We can highly recommend this hotel. Friendliness of staff. Comfortable room. No hassles. Just what you want for an overnight stay just after a long flight - no hassles. Just a 15 min easy drive from airport. Manager took 2 mins to book us in and surrendered his own car-parking spot so we could put our hire car under cover. Room was very clean - not small, not large but sufficient. Comfortable bed. Nice place to stay immediately before or after flying. If we need to stay overnight near the airport or the ship terminal again then we'll definitely stay here. This new modern otel is ideal if you need to get to the airport early. Plenty of parking, many resturants nearby and a reasonable rate. Rooms are small, clean and basic but have all you need. Being new makes a difference. We arrived in at 11pm at night. Everything all sorted out for us to let ourselves in. We had stayed there a fortnight before for the night as per usual everything was just great. Ahh just a moment, had a thought. Road works being done right out the front, what a mess BUT no sound of it in the Motel. Of course that is not the Motels fault, so well done Ascot Motel for being so quiet . We always stay here when in Brisbane. Stayed for 3 nights prior to going on cruise. Check in was simple and room was ready on arrival. Room was spacious with balcony and spotlessly clean. Ample tea and coffee supplied. Room was made up daily and staff were very friendly and accommodating. Transfer (free) to cruise terminal was appreciated. Location wasv ery convenient to Bretts Wharf Ferry terminal, Racecourse Road and cafes/restaurants. Road works and weather were only areas of concern but not caused by Airport Ascot Motel. Would definitely stay again. We stayed one night to visit Eat Street Markets to celebrate our friend's birthday. Airport Ascot Motel may not be flash and on a main road but were we all very pleasantly surprised. Great friendly staff, spotlessly clean, modern bathroom, good pillows, comfy beds and quiet which is why I gave it 5 stars. Walking distance to Portside and Eat Street Markets. Free shuttle to cruise terminal. Short walk to Brett's Wharf to catch a ferry to city or Southbank. We had rooms 208 and 308 which are at the back of the block away from the main road. The hotel closed to public transportation such as ferry and bus. 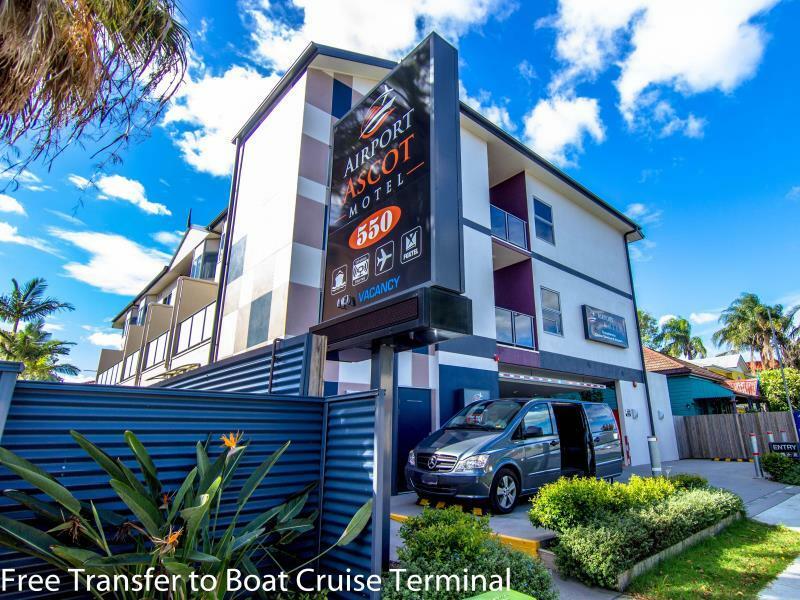 It is near the river, Bretts Wharf which convenient to take ferry (city cat) to the city. Beautiful houses & scenery along the river. It is also convenient to go for dinner & coffee shops around there. Stayed 1 night before joining a cruise. Location could not have been better for purpose. Went out of their way to assist in everything we required, free shuttle service etc. Reception was first rate, lovely young lady who was very accommodating, can't fault her at all. I would definatelt recommend them to anybody. If this is a four star hotel then the reviewer definitely need to go and take another look. This hotel is like a motel and I would put it at a 2 star motel. I would say four stars needs a pool, room service etc. This place you get your key and go to the pub for an Aussie dinner of the food they love, deep fried prawns and 40 lagers. we stayed in the upgraded room to have a little more space. It was well designed, clean, and the air conditioning worked well. the front desk staff were very friendly and helpful, ordering a cab. The stay was very good and the price was reasonable. We walked to a local restaurant for dinner - gino's, an Italian place, and really liked the pizza. our cab came when ordered in the morning to get us to the airport for a morning flight. Close to Airport. Modern clean venue. Close to a good variety of restaurants. In Brisbane overnight and out on an early flight. Staff arranged an early book-in due to an appointment I need to attend. Staff very helpful and friendly. Excellent restaurants only a short walk away. I would stay at this venue again when visiting Brisbane for a few days. Cleanliness, friendly staff, great rooms. We arrived an hour early and the staff made a special effort to get our room ready so there was no waiting around. They were very accommodating and friendly and explained everything to us regarding- dinner, local cafés, supermarkets, airport shuttle and more. The rooms are impressive and far beyond my expectations of a motel! Very clean, new looking and modern. After 5 days in a holiday park, the luxury of comfortable inner spring mattresses and quality bedding was a welcome relief! Clean, well appointed rooms. Friendly and efficient staff. On busy road, but well sound proofed and quiet. We have no complaints and were so impressed that we left and travelled for a few days and had no hesitation in returning. Staff courteous, cheerful and helpful. Very comfortable room and bed, with easy access by lift. Only constructive criticism, is that the shower head is set too high and maybe should have flexible/adjustable head that could be varied in height. Otherwise we would have no hesitation in recommending to any of our friends or families. Close to the airport and a very short stroll to the Porside full of lovley restraunts, shops and a cinema. Owners are Aussie and very helpfull. Rooms are small but clean and comfortable with a modern look. Agoda says airport transfers, but they are only in the morning fromthe hotel to the airport and there is a fee. There are no transfers available from the iaport to the hotel or at night. Very close to the wharf for cruise ship departure is why we booked. Nice eating places around wharf and very pleasant place to be in the evening. Rooms are small but comfortable. The manager was very helpful and friendly nothing was to much trouble. Would definately stay here again.